Key West is the end of the line or so the saying goes. Not only is it the southwestern end of the Florida Keys but it is also the southern most point of the United States. Key West has an aura to it that can't be found in many other American cities. Its uniqueness resides in things such as voodoo, ghosts and Hemingway's legacy. The island of Key West is small enough to easily bike around yet the town is bursting with life and vitality. Street performers pay homage to the breathtaking sunset every evening by putting on wildly entertaining shows while a refreshing margarita beckons from any of the numerous bars. 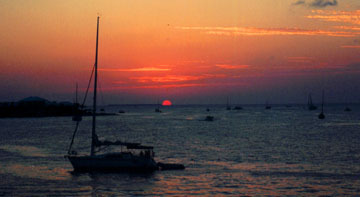 Key West runs on island time making it the perfect place to escape from worldly cares and stresses. A visit to Key West should be done at least once during your lifetime, but after experiencing this mystical town it is almost certain that you will find yourself returning to it again and again. Whether it is sightseeing, shopping, dining or water sports that makes a vacation enjoyable to you, it is sure to be found in Key West. The scuba diving off of the coast of Key West is absolutely phenomenal. Various companies offer everything from wreck dives to reef dives. No need to worry if you aren't certified, some companies offer training in the morning and diving in the afternoon, although this will not make you a certified diver. To experience a truly unique dive, be sure to sign up for a dive at the only living coral reef on the continent. The reef is only six short miles off of the coast. For those who prefer shallow waters, sign up for a snorkeling expedition with one of the catamaran companies. You will still get to see many fascinating water creatures up close and personal. Deep-sea fishing is also very popular in Key West and boats can be chartered for both half and full days. Vacationers who prefer to stay on the boat rather than in the water may join a sunset cruise. Other water related activities include kayaking, glass bottom boat rides, sailing, jet skiing, wind surfing and parasailing. 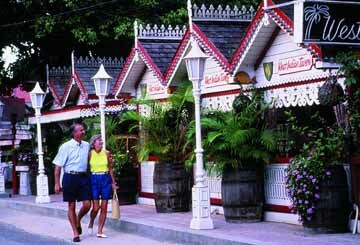 The people of Key West take immense pride in their rich history and diverse culture. Many famous people sought a break away from the everyday hustle and bustle and therefore headed to Key West. President Harry Truman frequented the town a great deal during his presidency. His residence during these stays, the Little White House, is open to the public. 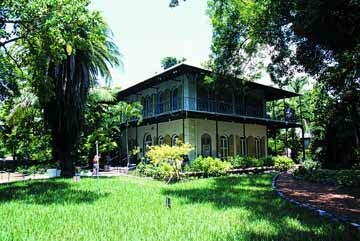 Anyone with a passion for literature should head over to the Hemingway House, the winter home of the great writer. Beautiful and exotic six-toed cats can be seen lounging on the porch or soaking up some sun just as felines from other generations did in Hemingway's time. At sunset, head over to Mallory Square to witness some of the finest entertainment in all of Florida. The Sunset Celebration draws hundreds of people every evening eager to enjoy the street performers. Other performers put on shows just over the footbridge at the Sunset Pier. The most interesting entertainer is definitely the Cat Man. Using only a soothing voice and the promise of a treat, he convinces his cats to do everything from walk across a tightrope to jump through a ring of fire. This is not to be missed. After the sunset entertainment, meander over to exciting Duval Street, the most happening street in town. Jimmy Buffet tunes waft from the open-air bars while people of all ages, shapes and sizes enjoy the unique, tropical ambiance. There are plenty of restaurants to choose from that offer all sorts of fresh local seafood. 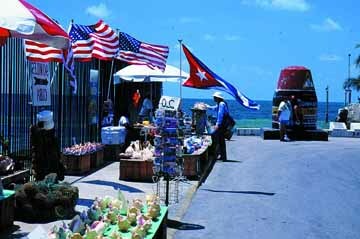 Duval is also bursting with specialty shops and art galleries and is the perfect place to pick up a reminder of Key West for when you are back home in the real world and it all seemed like a dream.